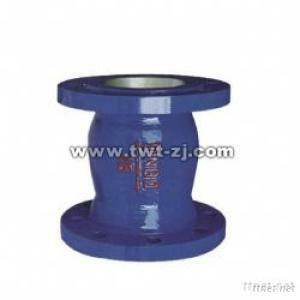 The silent check valve mainly consists of such major parts as body, seat, diffuser, disc, bearing and spring. The internal flow channel adopts a streamline design with extremely small pressure loss, Its disc has a very short travel of on/off from pump stopping to quick shut, AVOIDING HUGE SOUND OF WATER HAMMER FEATURED BY MUTE SHUT. The valve is mainly used for water drainage, fire control and heating and ventilation systems, which can be mounted at the outlet of water pump to avoid reflux and damages to the pump by water hammer.